Japanese commercial movie for Casio EX-FR10, a digital camera with detachable lens. The lens can be separated from the main controller and attached to various spots with the help of extra accessories. The video shows the benefits of the system. GoPro is the leader when it comes to wearable cameras and I think they can do the same thing with remote controls (or probably via phone apps). The FR10 still looks interesting though. Retail price is around US$450. I’m shopping for a new compact camera, this looks like an option. I’m not confident with the brand’s image quality though. My first digital cam was a Casio and I was not that impressed. But that was years ago, will have to check and see how things have changed. Japanese actress Aoi Miyazaki’s endorsement photos (new and old) for Olympus Pen [Jp] camera series. The gadgets should be the centre of focus but the styling caught my attention instead, love it. Image via Nihongirls. The Japanese company is primarily a toy-gadget maker. Many of its products are made for entertainment instead of genuine usability. It can be brilliant at times, just that it’s not something people would use often after the hype. 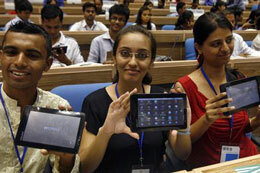 India has launched what it dubbed as the world’s cheapest tablet computer on Wednesday, to be sold to students at a subsidized price of US$35 and later in shops for about $60. The touch-screen device, called Aakash, or “sky” in Hindi, is currently assembled by a British company. A pilot run of 100,000 units will be given to students for free, with the first 500 handed out at the launch to a mixed response. Image by Parivartan Sharma, more details on Reuters. Very little technical information is available beside the fact that it’s running on Android. And speaking of “cheapest”, India also wowed the world in 2008 with Tata Nano, the world’s cheapest car, which is doing pretty well domestically. What you pay is what you get; but there’s always demand for cheap (and relatively low quality) stuff. Apple has just announced that iPad 2, the second generation of its popular tablet computer, will be on sale in Asia this week. 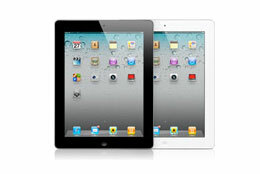 The iPad 2 will be available in Japan on April 28; and Hong Kong, India, Israel, Korea, Macau, Malaysia, Philippines, Singapore, South Africa, Turkey and UAE on April 29. Set aside Japan, iPad 2 is arriving in Asia sooner than expected. The original iPad was introduced in limited Asian countries after a few months, and it’s only available in Malaysia half a year after it was launched. It’s a bit of a surprise that it’s being released so early this time. The sales should go crazy, with people lining up hours to get the product first hand. It’s one human nature which I cannot understand… I mean, what’s the rush? We can always get it a week or two later, even if it’s temporarily out of stock. Suggested retail price for the iPad 2 with Wi-Fi model – US$499 for the 16GB model, $599 for 32GB, and $699 for 64GB model. iPad 2 with Wi-Fi + 3G suggested retail price – $629 for 16GB, $729 for 32GB, and $829 for 64GB.